Collecting TMNT figures is a never-ending endeavor. With hundreds of toys in existence from generations of mutants, completing the collection is a daunting, unwinnable challenge. The hopeless goal of "getting it all" becomes even bleaker when you factor in the accessories. Each figure included a wacky assortment of extras. Weapons, sidekicks, wearable fashion - there are thousands of plastic pieces. My childhood bedroom floor was littered with these silly TMNT accessories. Although there are a heap of these things in The Sewer Den, here are 10 of my favorites. Cinematic history in the form of a 2 inch plastic toy. 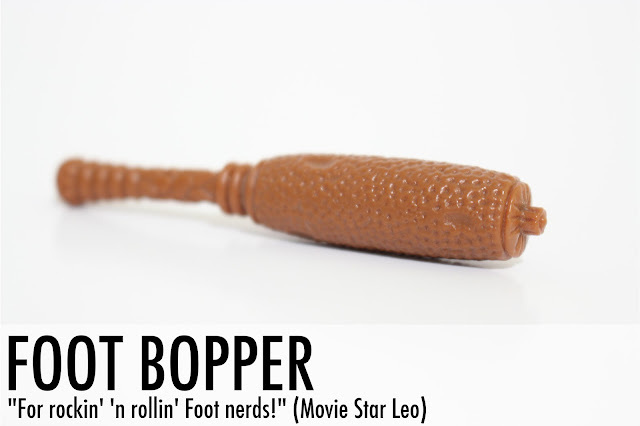 The Foot Bopper (I think) was featured in TMNT 2: Secret of the Ooze, released in 1991. But if memory serves me correct, it was Donatello who used this accessory, not Leonardo. But, 1991 was the wild west of toy creation. No one batted an eye over mistakes like this. And really, who cares? It's an accessory modeled after a foam bat. Just swap it from Leonardo's action figure to Donatello's and you'll be set. New or old, TMNT accessories are usually pretty outlandish. With such wacky attributes, they can be mutants themselves. 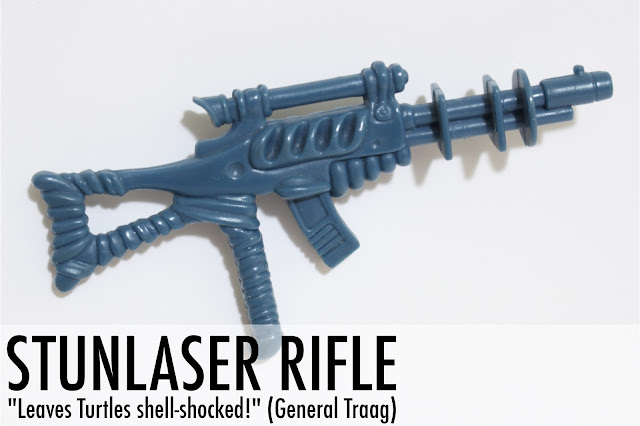 That's why the simplicity of General Traag's Stunlaser Rifle always appealed to me. It actually looks menacing. When it came to playtime, the rifle was a steady constant in many of my childhood memories. When playing with my toys, the bad guys always had this intimidating weapon on hand - striking fear into my heroes...at least until it was dinner time. There is a reason we idolize musicians. They are creative souls leading lifestyles that leave us jealous. But most of all, the envy stems from their accessories. 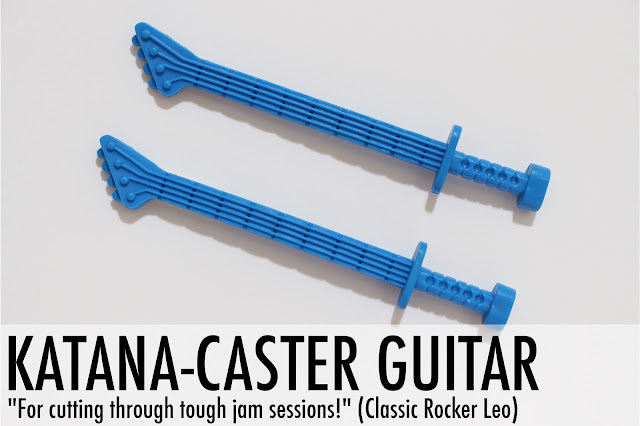 Especially when music meets weaponry, as the case with Classic Rocker Leo's Katana-Caster Guitar. I mean, com'on...the dude has musical swords! He's turning every battle with the Foot Clan into a jam session. That's a show I want front row tickets to. My admiration for Zak the Neutrino's accessory can be chalked up to my love for the movie, Back to the Future 2. 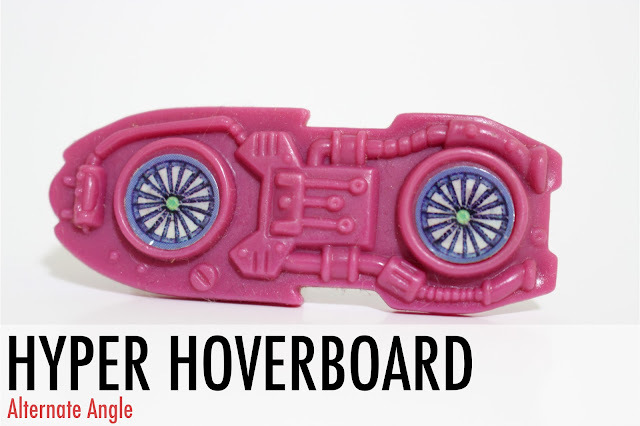 The purple piece is a homage to the iconic hoverboard from the classic film. Kids dreamed of riding around on this futuristic movie prop. The Hyper Hoverboard was the closest we ever got back then. No, we never cruised around on real hoverboards as kids, but thanks to Zak the Neutrino, at least our TMNT action figures did. I'd zoom my TMNT figures around the sewer & Technodrome playsets on this accessory - imitating the slick moves of Marty McFly. 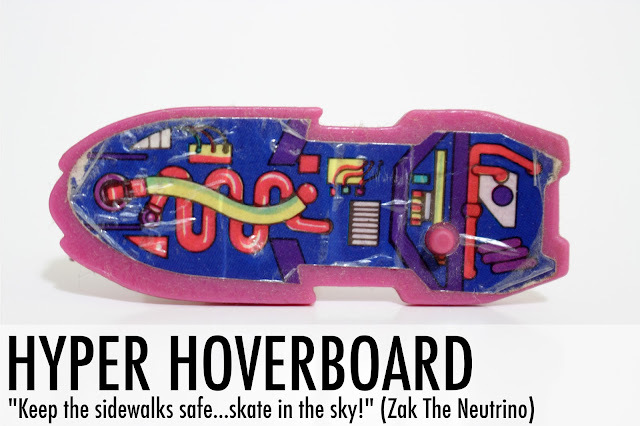 Unfortunately, I still could never answer the big question - could Zak the Neutrino's hoverboard float on water..? A common accessory packaged with TMNT figures in the 80s & 90s were bombs. They often took the shape of small, handheld objects (eggs, soda cans, etc) and never looked right to me. It wasn't until Lieutenant Leo's set of Bowling Ball Bombs that I found happiness. Their Looney Tune likeness appealed to me so much. Lieutenant Leo could recreate a Wile E. Coyote-Road Runner-like feud when battling the Foot Clan. 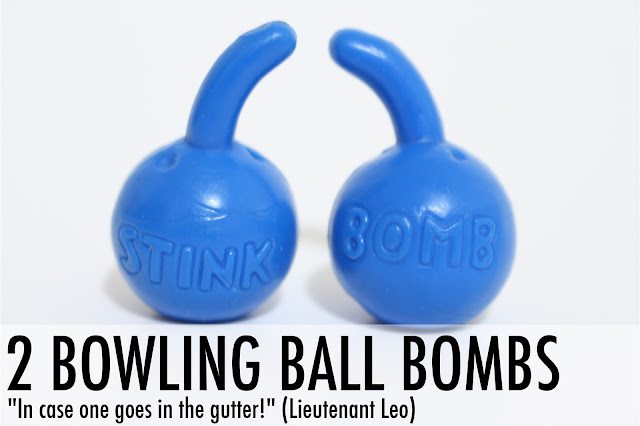 The Bowling Ball Bombs were also "stink bombs," an unobtainable myth kids dreamed of getting their grubby little mitts on to destroy the scent of their classrooms in school. 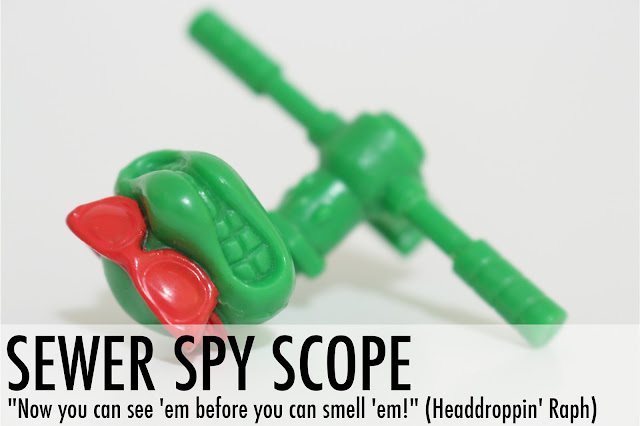 The Sewer Spy Scope is just weird. It looks like a horrifying prop from a Nightmare On Elm Street film. Its mystifying, uncomfortable appearance often left me scratching my head. Was the accessory cool or creepy? It has the head of an action figure, but the body of bicycle handle bars. It truly is a mutant. As a kid, I never knew how to incorporate it into my playtime. As an adult, I still find it oddly alluring. This mystery is tougher to figure out than the meaning of life. The macabre continues on the reverse side! A disturbing sticker of Shredder doesn't crush any childhood fears. 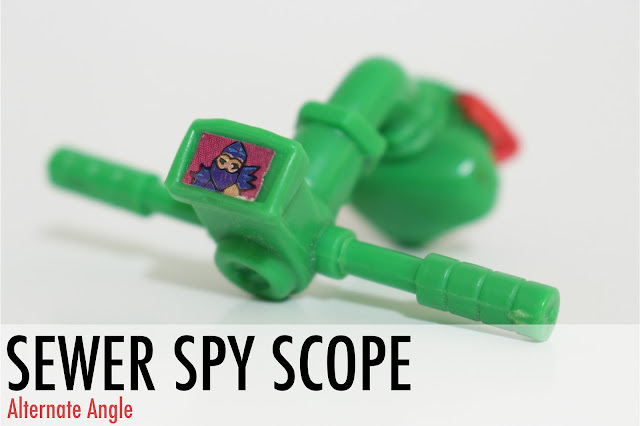 In fact, it's helping the Sewer Spy Scope seem even eerie as an adult. Grab your crucifixes, friends. Krang from the original cartoon is one of the best characters to ever hit the TMNT universe. The pink wad of brains had the best action figures too. 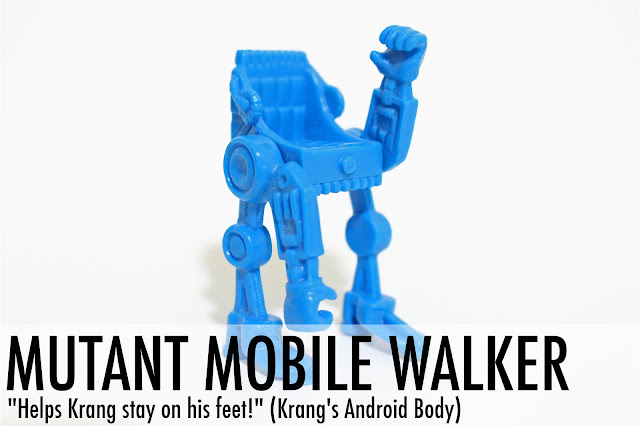 His standard-sized Android Body included a batch of fun accessories, but it's the Mutant Mobile Walker that's the greatest. It's a mini version of his 1989 release, but lacks any articulation or paint application. Usually that shortage of effort is frustrating, but it kind of works in favor for the Mutant Mobile Walker. It's locked in a Michael Jackson-like position. One arm aiming to the stars, the other to the sewers! Pizzaface is one of the ugliest mutants to hit the TMNT universe. His twisted looks made him a fan favorite and his accessories are just as warped. 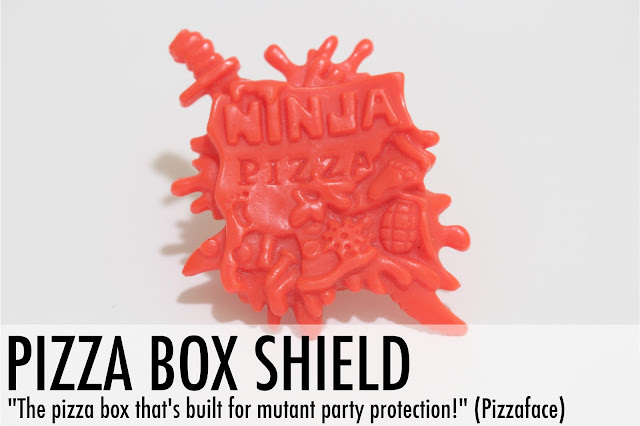 The Pizza Box Shield is my favorite of the bunch. It looks like a deranged Nickelodeon logo, showcasing everything kids shouldn't do. It's a demented PSA full of bad eating habits (pizza), explosives, and sharp weapons. It's an accessory for "bad kids." I was always a behaved boy, following the good ways of the ninja. The Pizza Box Shield was the closest I came to falling to the dark side. 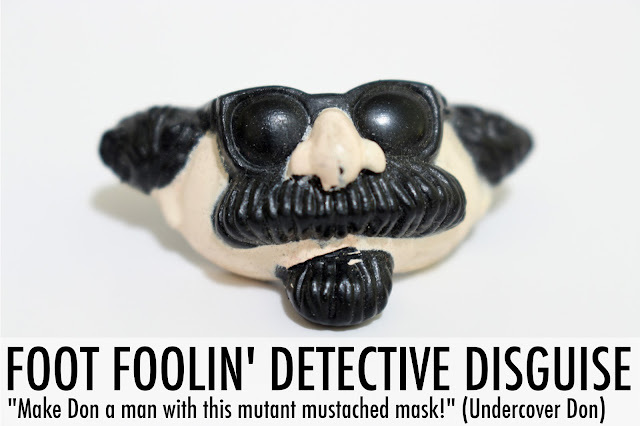 The Foot Foolin' Detective Disguise is my favorite accessory of all-time. This wasn't only a staple of my childhood playtime, but an inspiration. The Undercover Don action figure and his dopey disguise stirred up my imagination quite often. In a sense, it showed me the ways of fooling people. You could go from being a mutant, like Donatello, to a completely different person by just putting a mask on your face. Hey, it worked for my toys, so why not me? The following Halloween, I dressed up as Undercover Don. Although I didn't have a Foot Foolin' Detective Disguise like he did, my attributes had been completely altered and I truly felt undercover. That's some high praise for a goofy accessory. Accessories are a lost art. These eccentric creations helped shape the characters they came included with. The plastic pieces act as storytellers - carving out a legacy for each action figure. Even if they were over-the-top goofy, they urged kids to think more about the toys they were playing with. Sure, they're small, you often lose them, and they're impossible to collect, but accessories are awesome. It's amazing how much detail they packed into those accessories. That's one thing that's definitely missing with the new TMNT figures. 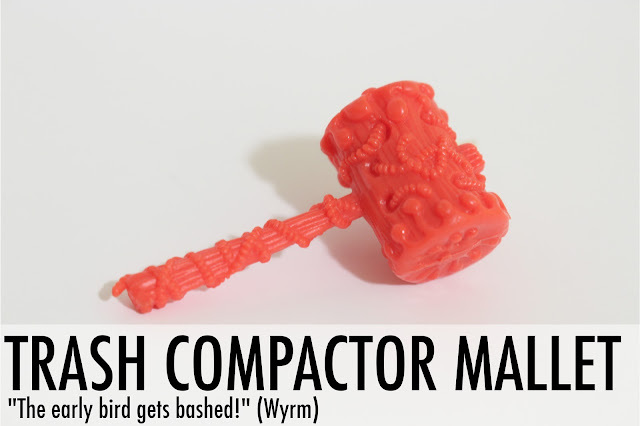 I just had to go back and look at Wyrm's mallet, and I remembered how much that figure creeped me out. I had a thing against maggots then, and all those tiny little worms were close enough for me to not like holding that mallet. Great job Playmates! I do love how wacky some of the TMNT accessories were. I'm tempted to do a similar post, it's so much fun to see them close-up like this!